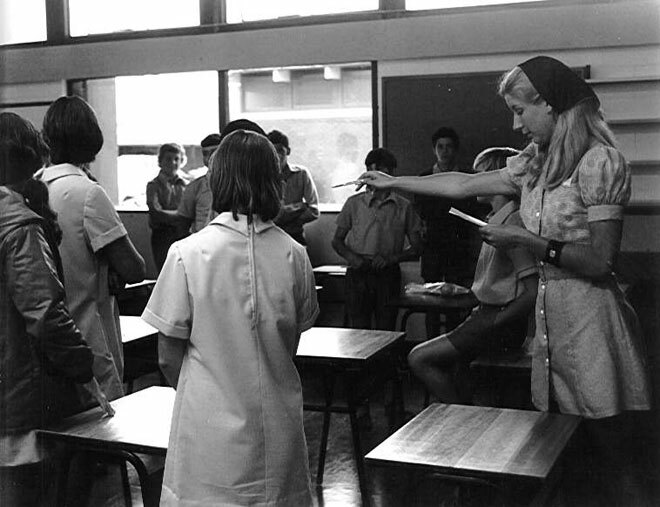 Students are directed to their desks by a teacher on the first day at Waiopehu College, Levin, in 1973. Population growth, and the expectation that all children would attend secondary school until at least the age of 15, meant that more high schools had to be built in the 1950s, 1960s and 1970s. Waiopehu College was Levin's second high school; the first was Horowhenua College, which by the early 1970s was struggling to cope with its roll of nearly 1,200 pupils.